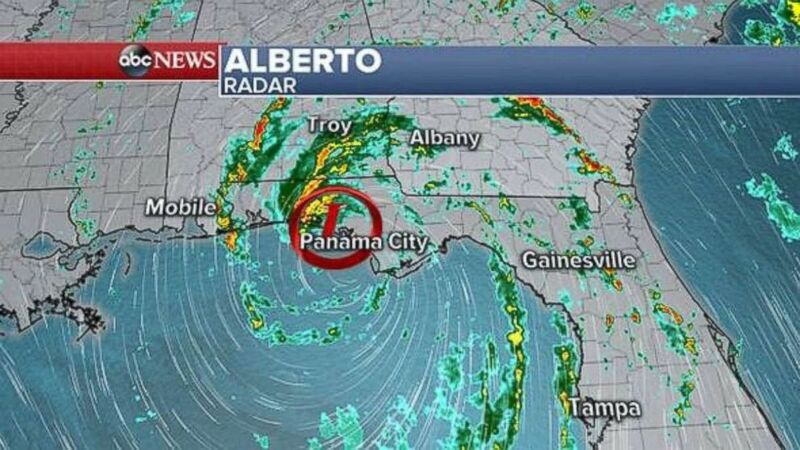 The storm was located near Panama City, Florida, around 5 p.m.
Alberto, the first named subtropical storm of the 2018 season, has made landfall on the Florida panhandle, bringing heavy rain, gusty winds and flash flooding to the area. The storm, which began to weaken as it approached the Gulf Coast, was about 15 miles west-northwest of Panama City, Florida, as of 5 p.m. ET, with the center moving onshore near Laguna Beach, Florida. Alberto's winds are reaching up to 50 mph in the heaviest rain bands. A wind gust of 56 mph was reported near Panama City, Florida, with sustained wind gusts of 45 mph Monday afternoon. Alberto remains a subtropical storm. States of emergency were declared in Florida, Alabama, and Mississippi, and tropical storm warning remains in effect along portions of the Florida gulf coast and along the Florida and Alabama state line. A Flash Flood warning was issued Monday afternoon in Okaloosa County on Florida's panhandle as a very heavy rain band moves through the area. 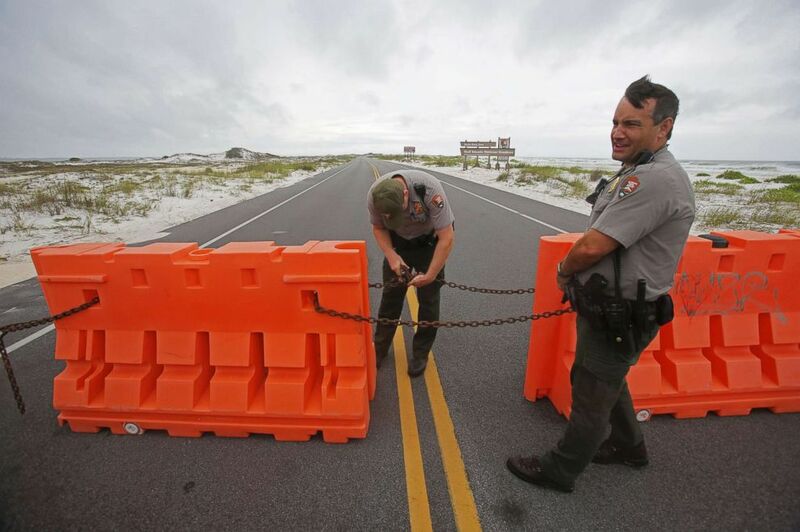 (Dan Anderson/AP) Rangers with the the National Park Service close off the Highway 399 through Gulf Islands National Seashore as a subtropical storm makes landfall, May 28, 2018 in Pensacola, Fla. 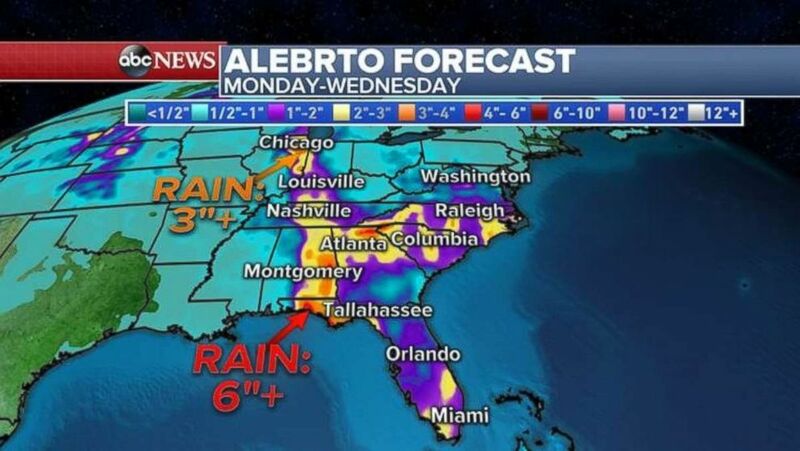 The biggest threat from Alberto will be possible flash flooding near the western panhandle of Florida as well as Montgomery and parts of southern Alabama. Some areas could see more than 6 inches of rain. 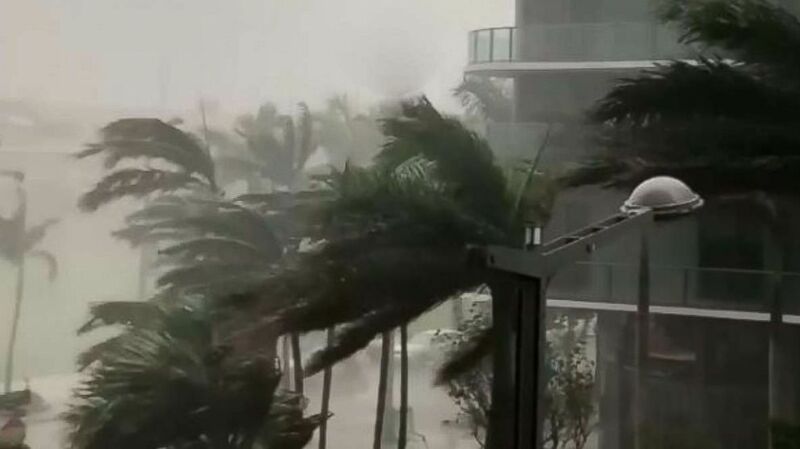 (@michaelscig72/Instagram) @michaelscig72 shared video on Instagram showing tropical storm Alberto, May 27, 2018 in Miami. Isolated tornadoes are also expected for most of Florida, Alabama, Georgia and the Carolinas. After making landfall in Florida, the storm will begin to significantly weaken. The heavy rain will reach Atlanta, the Carolinas, and Birmingham, Alabama, and move into Nashville, Tennessee, on Tuesday. 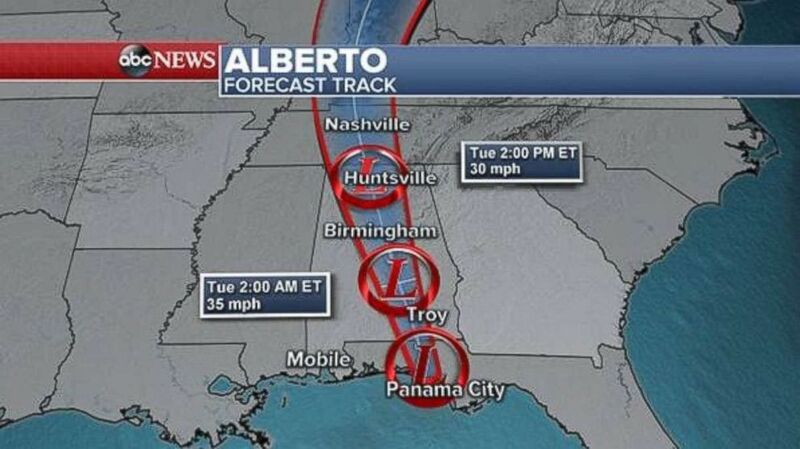 (ABC) Forecast track for Alberto. (ABC News) Rainfall totals will be highest in the Southeast, but areas of the Midwest could also see over 3 inches. There were 140 reports of storms, including eight tornadoes, on Sunday from the Midwest into the Rockies. 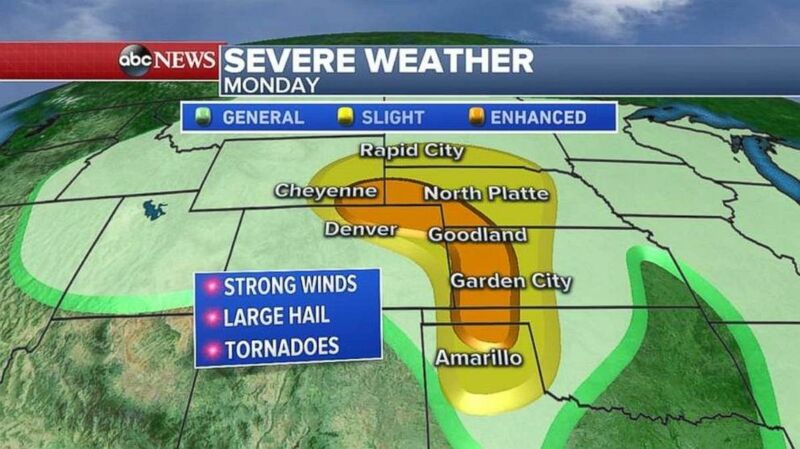 Severe weather is expected in the Plains today. Tornadoes, damaging winds, and hail are the biggest threats. Flash flooding is also possible. (ABC News) Strong winds, hail and tornadoes are possible in the Great Plains on Monday. 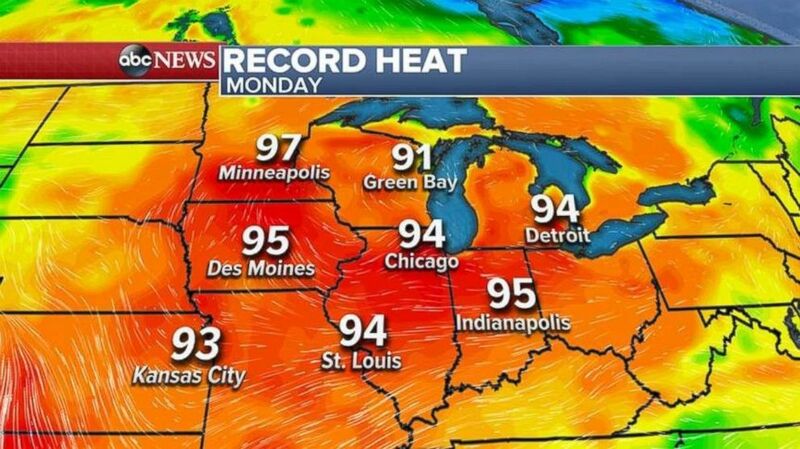 The Midwest and the Great Lakes experienced record temperatures over the weekend. The hottest temp recorded was in Madison, Minnesota, where it reached 102 degrees on Sunday. (ABC News) More record temperatures could fall in the Midwest and Great Lakes on Monday. Chicago hit 97, the hottest it's been in the city in the last five years. The mercury in Milwaukee, Wisconsin, touched 95 degrees, and Green Bay, Wisconsin, hit a high of 97 degrees. Even hotter temperatures are forecast for some areas Monday with more records possible.